What might be in this small package, you say? The answer: 2 packages of AAA batteries and 1 package of 9V batteries. They should have been included in the gift I dropped off at the church last Sunday, but I forgot them. Now, I have to rummage through the pile of gifts to find the box of battling boxing robots for a dear little 7 year old boy who asked Santa for a robot for Christmas. And who wants two robots with remote controls and no batteries? No one, that’s who! I should have opened the box and put them in the controllers before they were wrapped. Ah, well, I’m pretty sure a 7 year old can handle that part himself. And when he gets tired of playing with his robots, he’s also got a Star Wars Mad Libs and a Jedi Academy interactive journal to keep him happily occupied. 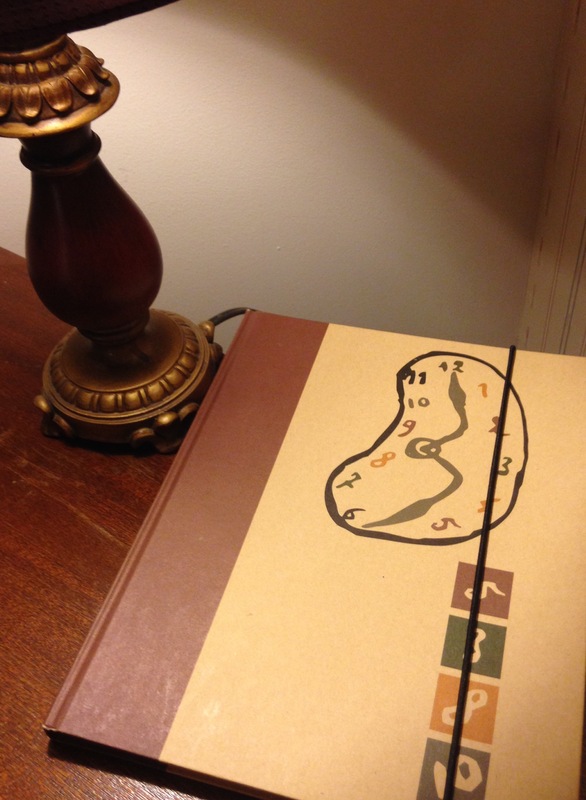 This is a very special journal. I got it several years ago while I was still teaching. The cover intrigued me with its melting clock, random numbers and elastic side fastener. I knew exactly how I would use the minute I picked it up. It was my retirement planning journal. I jotted notes, phone numbers, workshops, passwords, etc on its pages. I took it to every retirement meeting I attended whether it was in-district or at the state offices. I took it with me to my finical planner twice a year. Sometimes I would just take it out, turn the pages, and stare at it. I wondered if it was really possible. Was it realistic? Was this attainable? This melting clock was my reminder that there was a day and time somewhere in the future when I would meet my retirement goals. And guess what? I did. Almost two years ago. For the first year of retirement, this trusty journal remained with my official paperwork. I never opened it again, but I kept it just in case… just in case the IRS called me, just in case the school district called me, just in case the state retirement board called me, just in case. Last year, I took it out. It was time to put it to good use again. After all, it served its purpose so well I thought I could get one more ‘miracle’ out of it. I tore out the pages pertaining to retirement and filed those in a manilla folder. Now, with a clean slate, I use the melting clock to remind me that in time (no one knows how long) I would be a published author. This is my Submissions Journal. On each page, I write the title of a manuscript I have sent out into the world. Under the manuscript title, I write where, when, and to whom I sent it out. I count the months since the last submissions. I decide to either resubmit to new names and places or revise yet one more time. I take it out now and then just to stare at all the titles. I envision my published books in libraries and bookstores everywhere. But like my retirement plans, these things take time. I added a new page yesterday… a new manuscript, a new name, date, and address. Penguin receives a journal in the mail. He is told to write in it everyday. He grabs the journal and goes for a walk, but all he does is boring, ordinary, things. None of these things is worthy of being written in his journal. He imagines that if his life were more exciting, there would be interesting things to write in his journal. Little does he know that each of those ordinary things became extraordinary as he passed them by. They actually were more similar to his imagination than he thought, but he dismisses them as unworthy writing ideas. So he goes to bed thinking that nothing every happens at the South Pole, but hoping that tomorrow might be a better day for writing. This book was originally written in 1962 by Stan and Jan Berenstain as a follow-up to The Big Honey Hunt. However, the popularity of the Berenstain Bears in their first book led to a series, and the South Pole book was stored away in favor of the bears. The Berenstains wrote over 250 books in the series with Mama Bear, Papa Bear, Brother Bear, and Sister Bear. 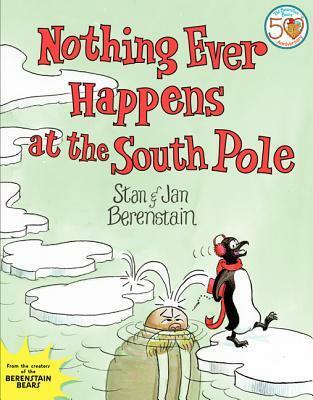 It wasn’t until after the death of Stan Berenstain, that Nothing Ever Happens at the South Pole was discovered in their basement archives. So with the help of her son Mike, Jan Berenstain finished the book. It was published 50 years after its original conception. I love the story of the little penguin who is blind to what is really happening around him and who doesn’t trust his own story writing ability in the first place. And I’m so happy that Jan and her son, Mike Berenstain found it before it was too late and offered it to a new generation of Berenstain fans.